The Shallows keeps getting better and better! DoorCountyNavigator.com loves this place and we highly recommend it! "Stay on the Bay. Shallows Resort"
Over the last year The Shallows Resort has added high speed wireless internet access (wi-fi now 5 times faster than before in every room and public areas too, like pool), and satellite flat-screen TVs for each of the rooms with over 100 channels, 70 being HD channels! They also updated all the bedding with new linens and duvets. In 2014 they re-tiled all the bathrooms in the motel building. What great additions to an already wonderful place! They are keeping up with technology while retaining their charm. We at DoorCountyNavigator.com love this place and highly recommends it. It keeps getting better. The Shallows Resort: And the tall tree stump that you saw when approaching the main office and building has been wonderfully transformed into a work of art – carved with intricate detail of an eagle high above, and a gradual transformation to a waterline with fish below. See the photo to the right! When we first met with Bob Dickson to take the tour at The Shallows, it was an early Sunday morning. Bob and his wife Liz are the property managers. Bob wears many hats, and this morning he is primarily greeting guests, saying hello to some and good-bye to others, always calling them by their first name and helping any way he can. Of course he has already put out juice, coffee and donuts for his guest in “The Gathering Room” located in the Shoreside Motel, one of the many buildings offering guest accommodations at this resort. A continental breakfast is offered seven days a week from 7:30 am to 10 am. As we walked along about the grounds of this waterfront resort, it was easy to see that this is a family resort, filled with beauty and tradition. The entire grounds at The Shallows are wonderfully landscaped and decorated with an abundance of flowers like you have never seen! Window boxes, hanging and freestanding flowerpots are everywhere. Along every path or brick walkway you will find more beautiful flowers decorating the grounds. Add this to the secluded location and the shoreline of the Door County peninsula and it’s easy to see why people love it here! 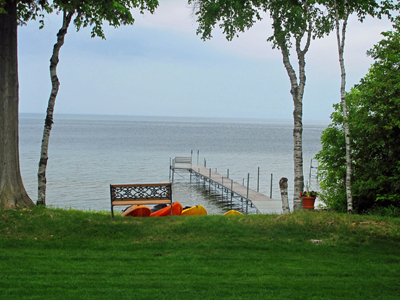 They have all the resort amenities like heated pool with Jacuzzi hot tub, tennis court, free rowboats, canoes and bikes, two picnic areas, two areas for nightly bonfires, a children’s play area and a beautiful setting, right on the waters of Green Bay. 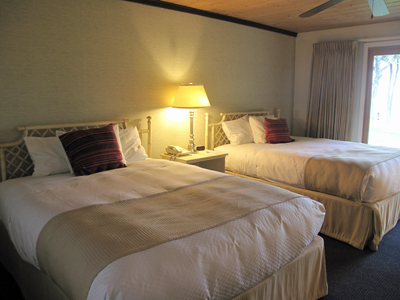 And you have a lot of accommodation styles to choose from ­take a look! This is the main building which houses the gathering room and guest check in. The gathering room is where they serve the continental breakfast. With windows o n three sides, it is a large room, offering a view of the pool, and, of course, the water. Sit at a nice table, or plop down in real comfy chairs and relax. And this is more than a place to have your morning coffee. Bob explained to us that it is used for a variety of leisure activities. In the morning many of the guests meet here to read the paper, play cards or hold good conversation. At night families can enjoy a pizza, play games or just hang out. The rest of the building is comprised of 16 rooms, with nearly every room having a view of the water - fourteen rooms look out on the Green Bay waters, while two offer a nice view of the woods. Most rooms have two queen beds, while one room has a king bed and another has one queen. A typical room in this building has a refrigerator, microwave, color TV, air conditioning and ceiling fan, and are all nice and clean. The bathrooms are good sized with full showers with tub. A storage area or closet in each room offers plenty of space for your things. oors facing the water. Ground floor rooms have covered decks that allow you to walk right out to the yard and bonfire areas, or to the water and dock. Second story rooms provide an excellent view of the water. On clear days you can see Green Island, Chambers Island and even way over to Marinette, Michigan. This is a three bedroom, bath and a half cottage that sleeps six comfortably. It is located right on the shore, making it one of the most popular places to stay at The Shallows. It has a kitchen with stove, oven, microwave, refrigerator and dishwasher. With a large open living room with a fireplace and a bank of windows facing the water, the retreat is complete. What’s really cool is the two sliding glass doors leading to the screened-in covered porch ­ we liked screened-in porches ­ no pesky bugs to deal with ­ what a perfect place for dining or relaxing while watching the sunset. It even comes with a picnic table and gas grill! Bob told me that he has guests who are fourth generation who come to stay at the cottage every year! The beach house is located on a private part of the property set partially in the woods. These are 2 story townhouse-style luxury rooms. The downstairs has a full kitchen, dining area with table and four chairs, living room with TV/VCR, storage closet, half-bath and screen doors to a deck facing the water. Upstairs you will find a full bath with tub and the two bedrooms. One bedroom faces the woods, has a nice closet, two single beds, a ceiling fan and a private balcony. The other bedroom has a queen bed, dresser, TV, nightstands, closet and a private balcony facing the water. These rooms are nicely decorated with rattan tables and chairs, three cushioned couches and plenty of natural light. Our favorite part of these townhouses is the backside porches complete with picnic table and gas grill! While viewing these accommodations we spoke with “Les,” a regular visitor, and all he would say was “ keep this place a secret”! Sorry Les!